Children’s literature is at its core an intriguing phenomenon. The concept of adults, living in a very “adult world”, writing books they hope will appeal to children, who live in a world of fantasy and imagination, is fascinating. At the heart of every one of us, is the child we once were before society taught us to suppress our “childish” ways; the adult authors of children’s literature have, in a sense discovered a way to rebel against a forced adulthood and the seasoned reader knows that children’s books are just as much for adults as they are for children. Children’s literature is categorized by a broad spectrum of genres, some of the most well-known include: picture book, traditional literature, poetry, modern fantasy, nonfiction, contemporary realistic fiction, biography and historical fiction. This article will explore the inner-workings of eight different genres and the children’s books that best exemplify the characteristics of each prospective genre. Books in the picture book genre, combine pictures and text; both elements play equal roles in arriving at intended meanings. When thinking of which picture book to choose to best represent the genre, I wanted to select a book that showed mastery in the fine art of balancing illustration and text harmoniously. I tend to favor picture books that incorporate full-bleed, two-page spread illustrations because these panoramic scenes submerse readers in the world the author has created. 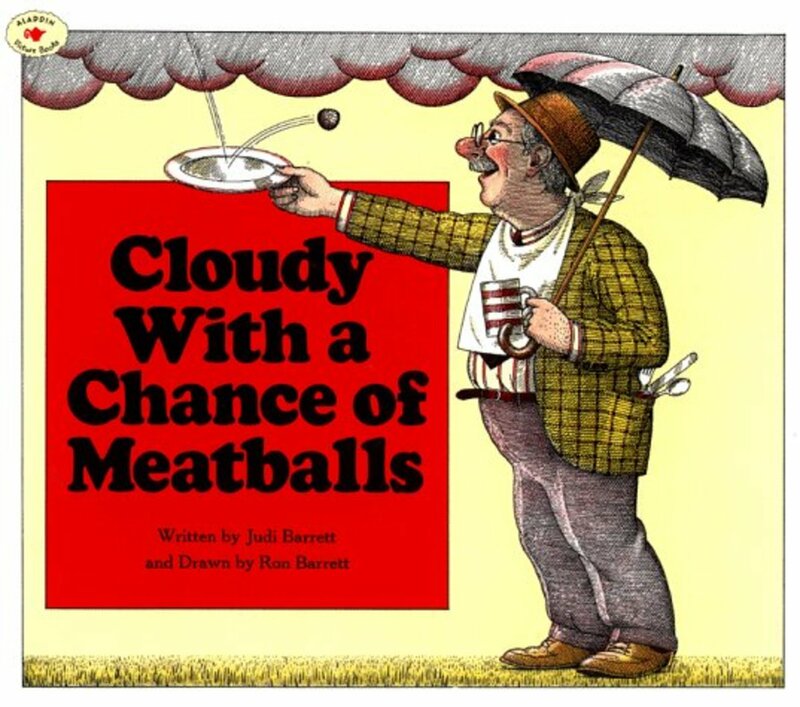 I eventually decided on Cloudy with a Chance of Meatballs, written by Judi Barrett and illustrated by Ron Barrett because it effectively incorporates panoramic illustrations with a humorous and fun plot that leads readers through the fictitious town of Chewandswallow. 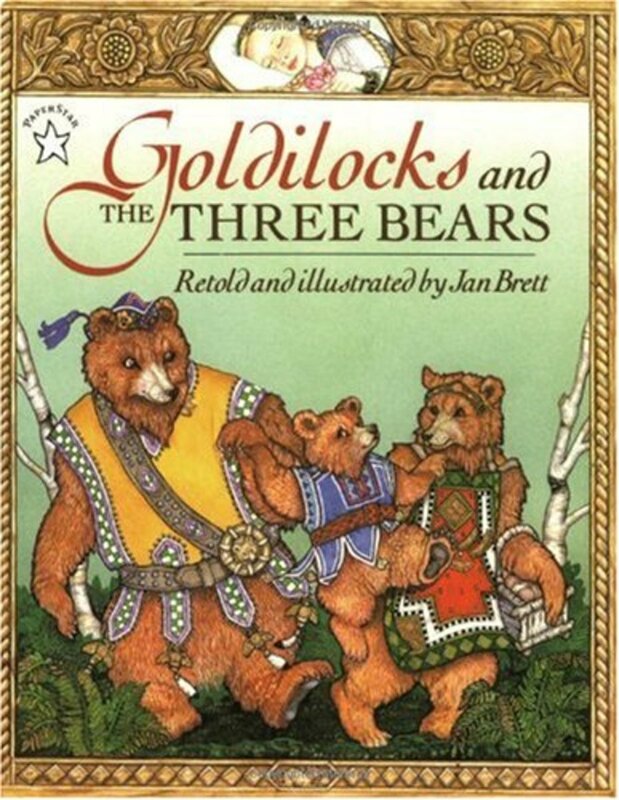 Another book that deserves recognition for realistically texturized, full-bleed illustrations that do not overshadow its text, is a book of the traditional literature genre, Goldilocks and the Three Bears as retold and illustrated by Jan Brett. I chose this story for its strong moral lessons and because as a child it was my favorite bedtime story. This traditional folktale has a rich cultural history and displays the traits of authentic folklore with its natural sounding language and straightforward plot structure. The natural sounding language of traditional literature is hard to achieve in the realms of poetry but T.S. Eliot pulls it off perfectly in his book of poems titled, Old Possum’s Book of Practical Cats. As a lover of both cats and poetry, I couldn’t resist this book because it infuses the perfect mix of mysterious feline prowess, with lyrical poetry that just begs to be read aloud. Eliot’s collection of poems combine unlikely words in interesting, new ways. In the fantasy genre I felt it only right to choose the book that I believe best embodies all the characteristics of a quality fantasy text. The Giver, by Louis Lowry is a novel that explores the alternate reality of a world unlike our own, where people feel no fear or pain. As unbelievable as Jonas’, fantasy world of black and white seems, Lowry describes this new world in such detail that it becomes completely plausible to readers; indicative of the effectiveness of The Giver as a fantasy book. The nonfiction book, Pop! The Invention of Bubble Gum by Megan McCarthy is the complete opposite of the fantasy novel The Giver. Unlike fantasy, the nonfiction genre includes books that are either expository or informational and the purpose of these books is to get readers thinking critically. McCarthy’s picture book Pop! The Invention of Bubble Gum describes how accountant, Walter Diemer invented bubble gum for the Fleer Corporation while simultaneously including historical fun facts about gum. I chose this book because not only is it factual and an accurate representation of a historical invention, it also includes fun facts and vibrant full bleed pictures that correspond with the text. Interestingly, the contemporary realistic fiction genre includes books that sound as if they could be nonfiction but are actually fictional representations of realistic characters confronting challenges that are common in the contemporary world we live in today. I chose Joan Bauer’s young adult novel Hope Was Here to represent the contemporary realistic fiction genre because Bauer’s quirky multi-dimensional characters lack stereotypes and overcome realistic challenges in believable settings that are reflective of the modern world. I particularly like this book because the protagonist of the story, Hope has a humorous and witty personality that makes her character relatable to readers. Another multidimensional character who led an inspiring and successful life that was not without its challenges is Steve Jobs, whose biography I chose to represent the biography genre. The specific book is called, Who Was Steve Jobs? by Pam Pollack and Meg Belviso; it is a factual biography that tells the story of Steve Jobs’ life chronologically from the day he was born to the day of his tragic passing and all the failures and successes he experiences in between. Unlike the more commonly known biography about Steve Jobs’ life, written by Walter Isaacson which is more geared towards adults, Who Was Steve Jobs? is a biography that was written for children. 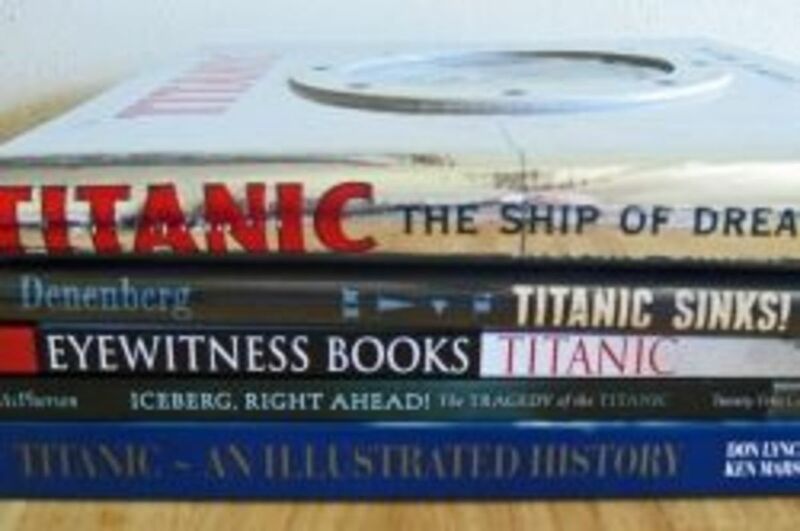 Not to be confused with nonfiction or biography, the historical fiction genre contains books that tell stories of history. Historical fiction books weave fictional stories into factual historical events. The book I chose for this genre is The Watsons Go to Birmingham- 1963 by Christopher Paul Curtis. The book takes place in September 1963 during the civil rights movement and tells the story of the Watson’s, a fictional African American family who visit a grandmother in Birmingham and experience the tragic 16th Street Baptist Church bombing. I chose this young adult novel because it is accurate in its representation of a historical event that acted as a catalyst in the civil rights movement and the fictional family is relatable, helping readers better understand issues such as segregation in America. 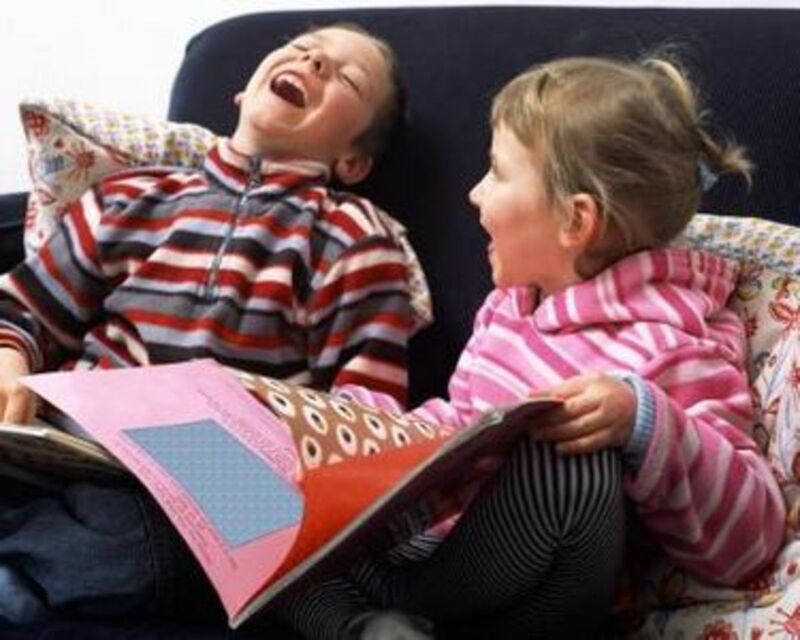 Typically young children are introduced to literature for the first time by means of picture books. 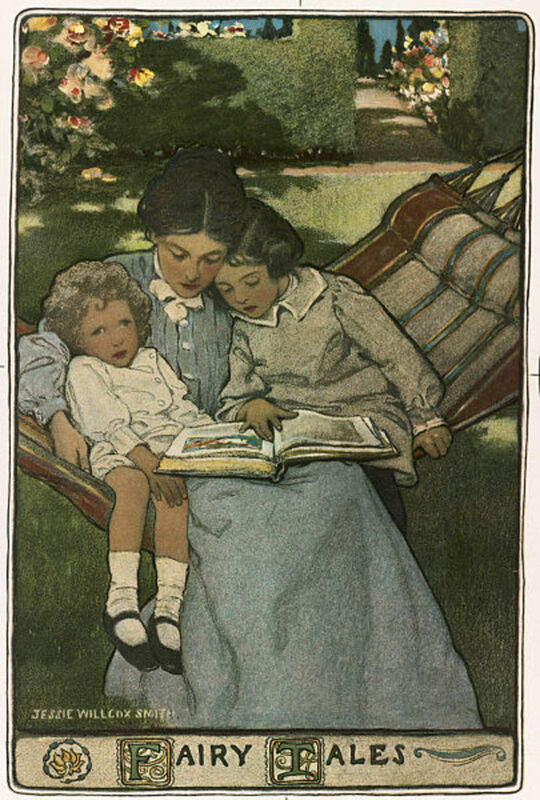 While it is a common misconception that the illustrations in picture books are intended to help young children who can’t read, understand stories, this is not the case; neither the pictures nor the text can be relied upon solely to get the whole story, both parts must work together actively to arrive at the whole. The picture book I chose, Cloudy with a Chance of Meatballs begins with a grandfather telling his grandchildren a tall-tale story about a town named Chewandswallow. The townsfolk never have to worry about preparing their food or even going to the grocery store to buy it; each of their daily meals falls from the sky. The townsfolk get along just fine until something terrible happens and the weather patterns become catastrophic. 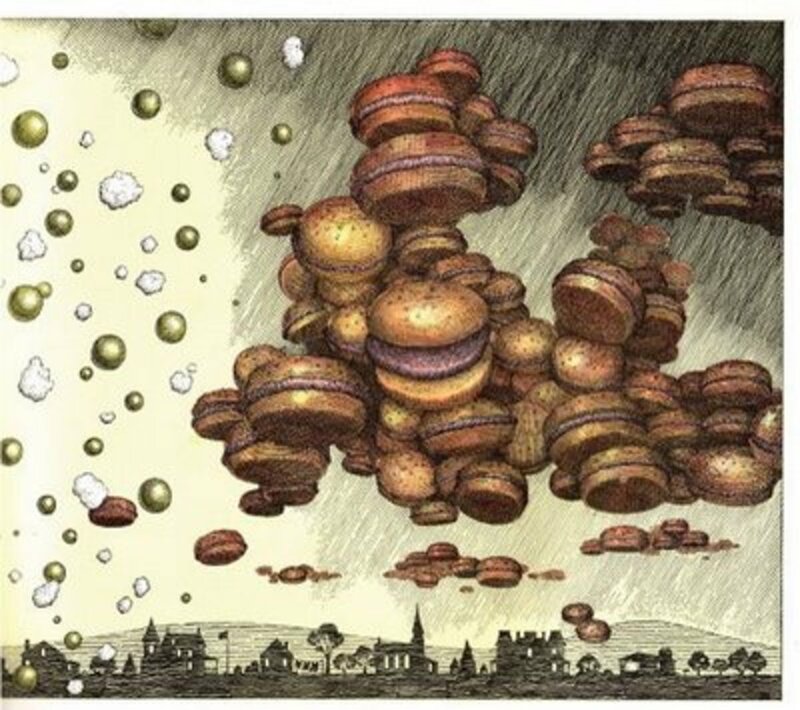 Food that gets bigger and bigger starts falling from the sky, destroying homes and schools. The townsfolk are eventually forced to move to a new town that has regular weather patterns. The targeted age group for this picture book (children four to eight) are still learning that too much of a good thing can be bad, the theme of this story. Some other lessons to take away from this book are: “if something seems too good to be true to probably is”, and “nothing worth having comes easily”. The story opens with illustrations that are sketched in only black and white. However, when the grandfather introduces his grandchildren to the land of Chewandswallow, the sketched illustrations are filled in with watercolors and brought to life. This coloring technique illustrates the transition from realism to the birth of the fictitious, fantasy land of Chewandswallow. Cloudy with a Chance of Meatballs fits into the criteria of the picture book genre because the text works in conjunction with double page spread illustrations to move the story along from beginning to end; the illustrations are meaningful and correspond with the narration of the text. For example, at one point in the story Judi Barrett (1978) writes, “After a brief shower of orange juice, low clouds of sunny-side up eggs moved in followed by pieces of toast (p. 12).” The corresponding picture shows a tree that has sunny-side up eggs and pieces of toast hanging from its branches, as a little boy sits at its trunk with a glass in his outstretched hand, attempting to catch falling drops of orange juice. 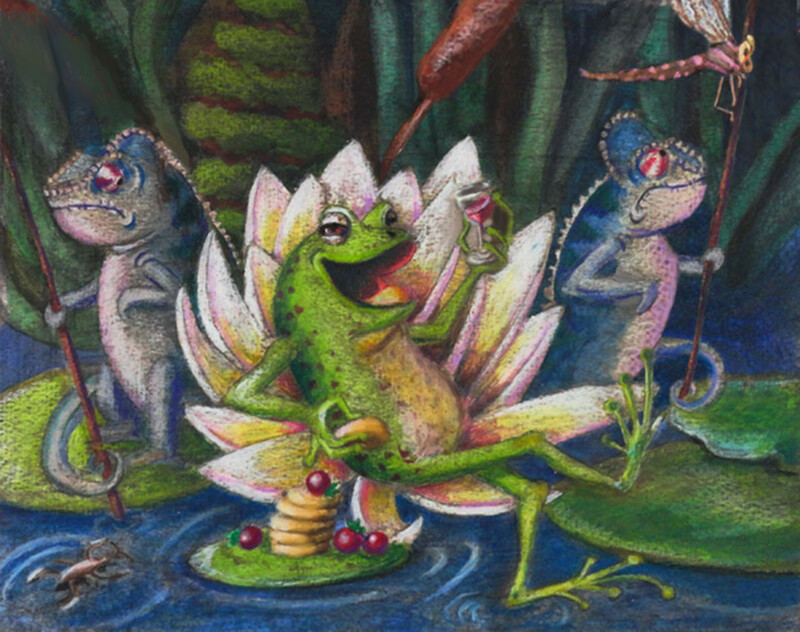 Demonstrative of a high-quality picture book, the illustrations and text are working together dynamically to produce meaning throughout the entire story. The traditional literature genre contains folktales that have a rich cultural history and were passed down by oral tradition before the days of printing presses. The book I chose to represent the traditional literature genre is Goldilocks and the Three Bears, as retold and illustrated by Jan Brett. This classic tale is about a young girl named Goldilocks who wanders through the woods and stumbles upon the house of a family of bears. When the bears are gone, Goldilocks goes inside and makes herself at home. When they return home, Little Bear sees Goldilocks sleeping in his bed. The main characters are, Goldilocks, Little, Small, Wee Bear, Middle-Sized Bear and Great, Huge Bear. Jan Brett’s retelling of the story remains true to John Hassall’s 1904 version of the tale, with her use of short simple sentences and a modernized plot. This book fits genre criteria in that it has a defined theme and contains folktale morals and motifs such as the motif of the number three (e.g. the three little pigs, Goldilocks and the Three Bears). The theme of the story is to consider how our actions affect others. The tale promotes the virtues of self-awareness, respect for others, and self-control. “Somebody has been sitting in my chair!” said the middle-sized bear, in her middle voice. And you know what Goldilocks had done to the third chair. “Somebody has been sitting in my chair, and has sat the bottom right out of it!” said the little, small, wee bear, in his little, small, wee voice (Brett, 1996, p. 18). 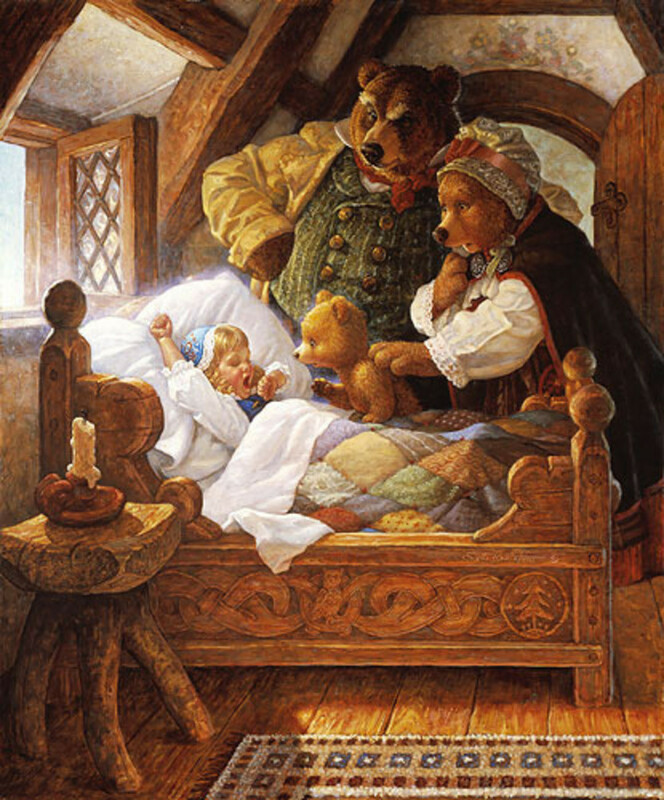 Even though Goldilocks destroys little, small, wee bear’s personal belongings, when the family of bears finds Goldilocks sleeping upstairs they do not harm Goldilocks in any way for trespassing but rather, watch her escape through their open window without even attempting to catch her the way a typical pack of ravenous wild bears would. Early versions of the fairytale, Goldilocks and the Three Bears consisted of retellings which date back to the 1830’s and have kept the story alive today. 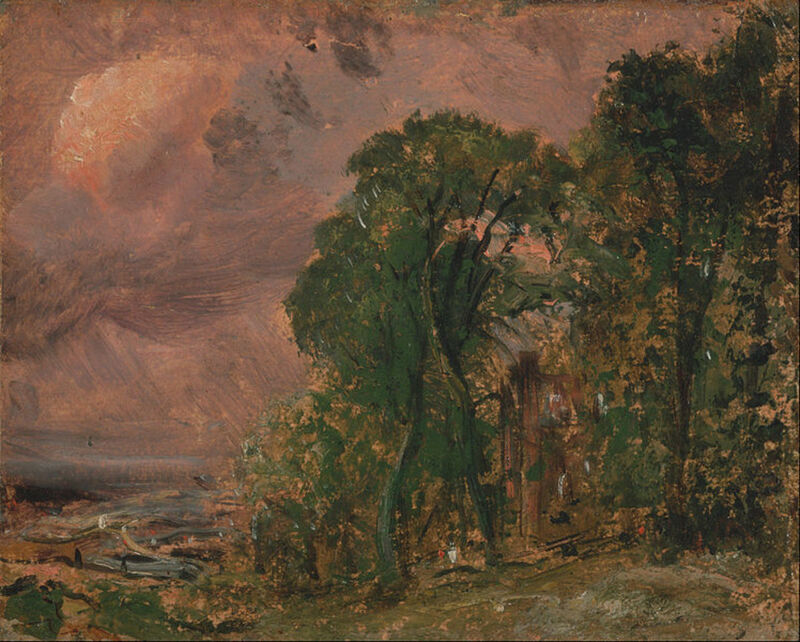 In 1837 the story was retold by Robert Southey; this was followed by Joseph Cundall’s version published in 1850. It wasn’t until 1904 that the name “Goldilocks” was first used by John Hassall (McElmeel, 1990). 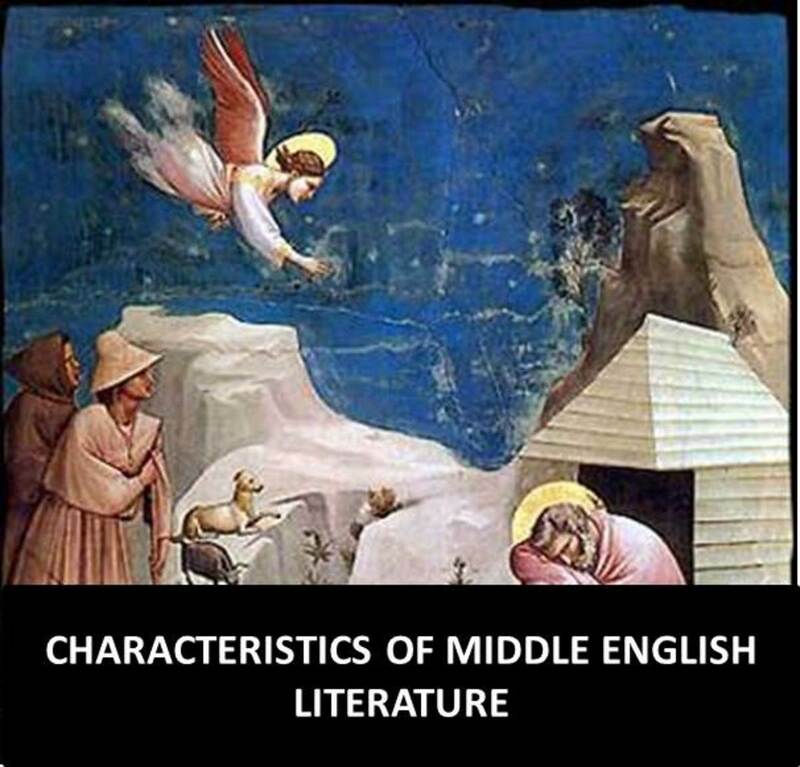 These tellings and retellings as well as the evolution of the story itself to accommodate modern times, perfectly characterize the traditional literature genre. Goldilocks and the Three Bears was one of my favorite fairytales as a child; it’s a classic bed time story that parents have passed down to children for centuries. Part of what makes poetry enjoyable as a genre is the manipulation of language in clever new ways, so that when a poem is read aloud, it glides off the tip of the tongue and goes straight into our hearts and minds. 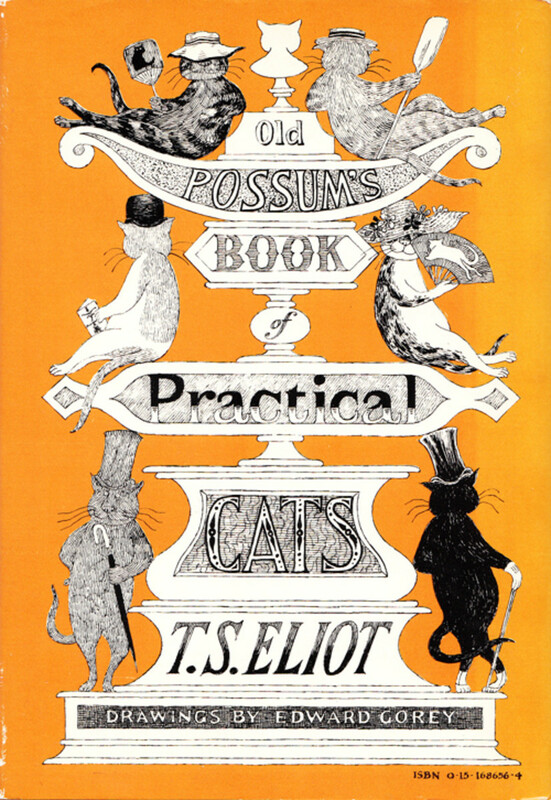 Old Possum’s Book of Practical Cats features a collection of poems written by T.S. Eliot, pertaining to the various types of feline personalities. Each of the poems is named after the particular type of cat it describes; fun, tongue-twister names invented by Eliot. The book of poems gives readers an inside peek at a world made new, as perceived by the fierce felines that roam the streets of the suburbs and the back alleys of cities, long after humans have fallen asleep. These poems invite readers to picture cats as the mysterious lionesses that they inherently are, rather than the domestic household pets they have come to be. Each of the poems is written lyrically and includes stanzas that are repeated two or three times throughout the prose, mimicking the repeated chorus of a song; it comes as no surprise that the legendary Cats musical was inspired by this book. The poems in this book have a rhyme scheme that flows naturally in a rhythmic way and are most delightful when read aloud, which I feel best represents the poetry genre as a whole. 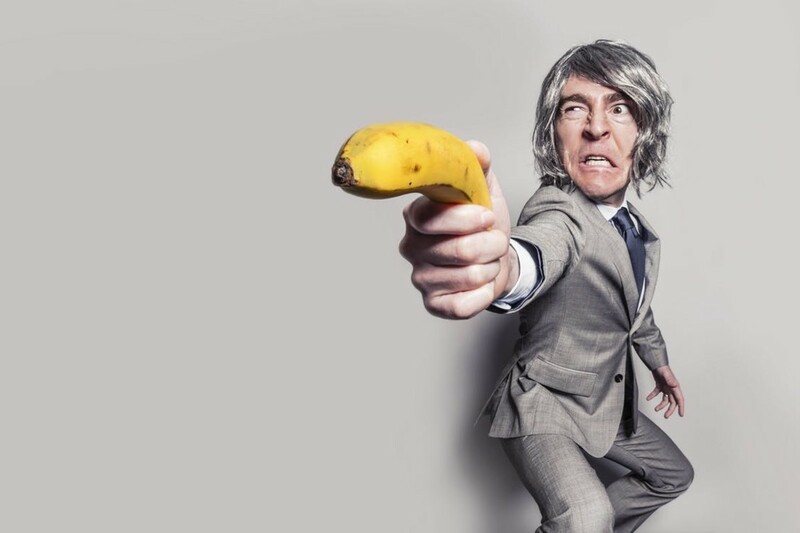 I chose these poems because they have a humorous and witty tone which is achieved through the inventive combination of wacky words that only a legendary wordsmith like T.S. Eliot could’ve thought up. He originally wrote the poems for his godchildren and the narrator “Old Possum” refers to Eliot himself. Poems that plunge readers into the late night adventures of mischievous cats are a favorite amongst cat lovers of all ages. Books included in the fantasy genre of children’s literature are similar to folktales in that they teach children life lessons. However, fantasy books differ in that they do this by suspending reality. Ironically, magical mirrors and flying broomsticks are used to teach realistic life lessons while at the same time allowing the readers’ imagination to roam freely. 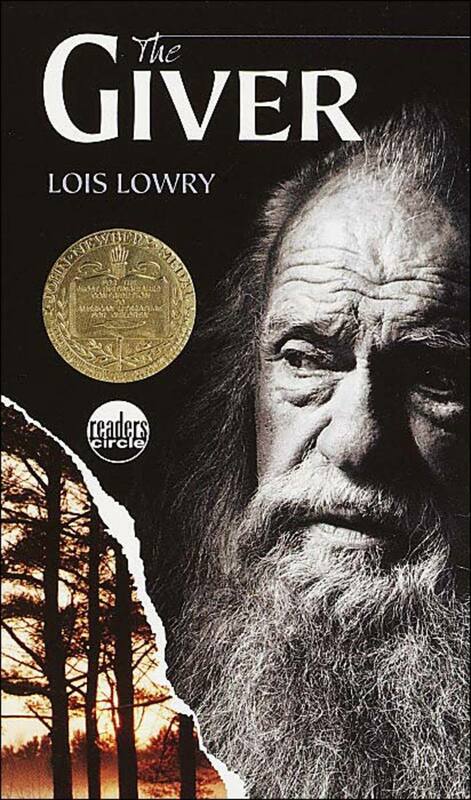 I chose the classic young adult novel, The Giver by Lois Lowry to represent the modern fantasy genre. Lowry’s novel offers a fresh new take on the fantasy that has been enchanting the world since before Walt Disney brought his magical animated characters to motion picture screens. The protagonist of the novel Jonas, lives in a peculiar world where everyone is similar and no one feels pain or fear. At age twelve, every citizen attends a ceremony called “the Ceremony of Twelve” where each person is assigned a role within the community. At the Ceremony of Twelve Jonas realizes just how different he is when he is assigned to the prestigious role of Receiver of Memory. In Jonas’ society when pain, sorrow and pleasure were abolished, every citizen was wiped clean of his/her memories and now one person is responsible for keeping these memories, the Receiver. Once Jonas is assigned his role, he seeks guidance from the Giver, the man who is responsible for transmitting his memories to Jonas. Jonas and the Giver eventually devise a plan for Jonas to leave their society and enter into the land of Elsewhere so that all the memories Jonas is harboring will be transmitted back to each person in his society and they will all be forced to feel emotion again. Now, through the memories, he had seen oceans and mountain lakes and streams that gurgled through woods. . . He saw all of the light and color and history it contained and carried in its slow-moving water (Lowry, 1993, p. 131). Details like these turn a typically unfathomable world into the reader’s only reality. Another rule within the genre criteria for fantasy books, is that these books contain a meaningful theme. Meaningful themes explored in The Giver, are both the importance of our memories (even the painful ones), and the importance of being unique individuals; individuals who do not feel the need to conform to society’s standards of what we ought to be. This modern fantasy novel describes a world that seems vastly different from the real world, but interestingly enough the society that Lowry describes is an example of what our society would be like if we were never forced to deal with pain. Typical of the fantasy genre, this novel causes readers to view life differently; oftentimes we wonder why we must deal with traumatic events and lingering painful memories but through this book Lowry allows us to see that without pain, all the pleasures of life would be completely devoid of meaning. The nonfiction genre of children’s literature contains books that are either informational or expository in format and serve the purpose of informing young readers about certain concepts by providing them with factual information on subject matters. Nonfiction books explore almost every topic under the sun and serve as an endless source of fascination for curious readers looking to quench a thirst for knowledge. For the nonfiction genre, I chose a book called, Pop! The Invention of Bubble Gum by Meghan McCarthy. Pop! tells the story of accountant, Walter Diemer’s invention of bubble gum which ends up saving the Fleer Corporation from having to shut down. The setting is in Philadelphia during the 1920’s at the Fleer factory where Diemer experiments with various concoctions that repeatedly fail to produce desired bubble gum effects. 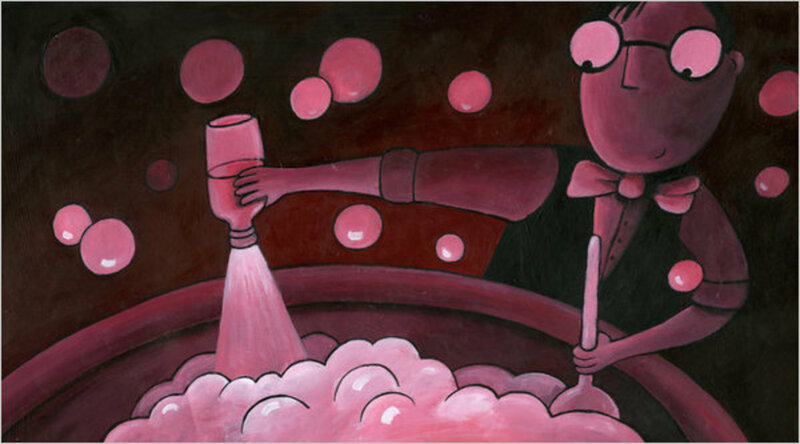 Finally Diemer stumbles on the right concoction and has all the coworkers in his office blowing bubbles. I chose this nonfiction book because it doubles as a picture book with full bleed, double page spread illustrations and aside from Diemer’s invention, it is chock-full of fun facts about gum. For a book to be high-quality and represent the nonfiction genre its facts must be accurate, the author should be qualified to write the book, resources consulted should be clearly listed and there must be a logical development of ideas. Pop! meets this criteria and after a bit of fact-checking I found all the factual information used in this book to be accurate. McCarthy has a credible reputation as a writer of children’s award winning, fiction and nonfiction books, which makes her qualified to write a nonfiction book like this one and she is sure to include a properly formatted list of sources at the end of the book. The story of Diemer’s invention is organized chronologically from the time the Fleer Company secretly tries to make a new kind of gum that blows bubbles, to the moment Diemer’s invention is delivered to stores of all sizes making the Fleer Corporation a huge success. 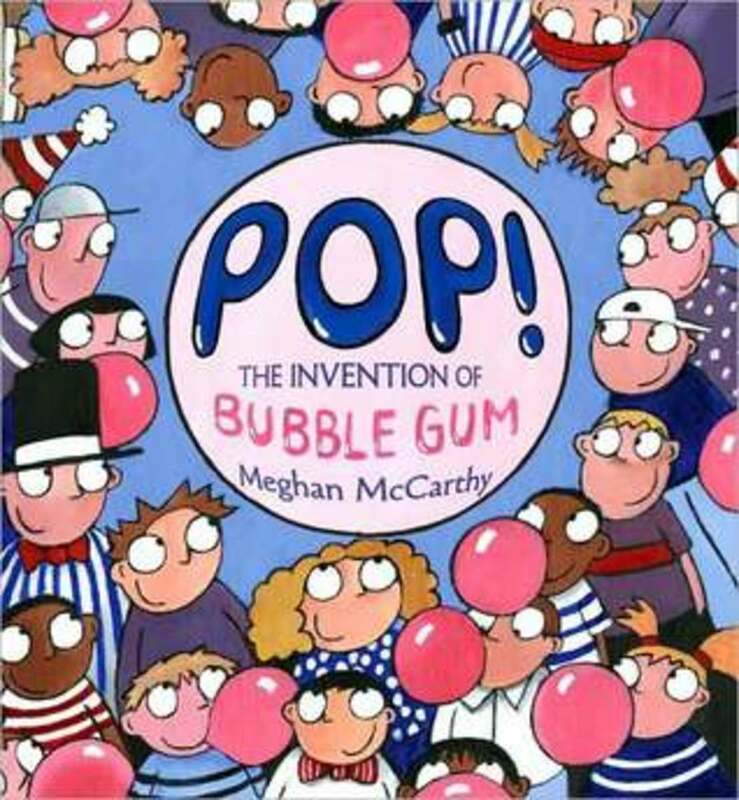 However, because this book is intended for children, McCarthy avoids going into too much detail about the particulars of Diemer’s invention and throws in fun facts about bubble gum instead. The contemporary realistic fiction genre of children’s literature includes books that explore the issues and challenges typical in today’s society. Contemporary realistic fiction books offer readers the chance to obtain the wisdom that comes from experiencing contemporary issues and problems, without actually having to go through them. The book I chose for this genre is, Hope Was Here by Joan Bauer. This young adult novel is about the untraditional lifestyle of protagonist, Tulip whose irresponsible mother abandons her at a young age and leaves her in the care of her Aunt Addie. Tulip later changes her name to Hope, which she feels will better represent her new life with Addie. Addie and Hope travel all over the country, working at different restaurants and diners as waitresses; Hope strives to be the best waitress she can be, all the while longing for some stability in her life and hoping to find her biological father.. Everything changes when Addie and Hope move to Mulhoney where they work at Welcome Stairways Diner. Hope winds up falling in love for the first time and helping G.T Stoop, the owner of Stairways Diner, who is battling leukemia, attempt win the election to become the Mayor of Mulhoney. I chose this book because though it explores serious issues which are commonly faced by today’s youth, like being abandoned by a parent or having an unknown biological father, Bauer finds a way to make her multi-dimensional characters humorous and witty in spite of all the challenges they must overcome. 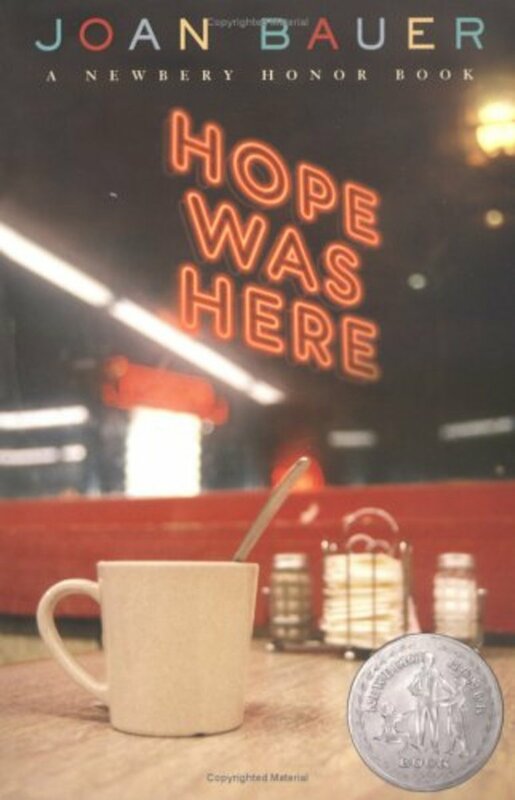 Hope Was Here is representative of the contemporary realistic fiction genre because in the plot, Bauer’s characters confront believable problems that are solved in realistic ways and the restaurant setting supports the events of the story. Hope confronts the challenges that a nomadic lifestyle and lack of stability bring her, with her positive attitude, humor, and hope for a better future and though G.T Stoop’s character must deal with the defeat of losing the election to be Mulhoney’s next mayor, he winds up taking it easy on his health and his leukemia goes into remission as a result. The coping strategies Hope learns at her high demand waitressing jobs, better equip her to handle the challenges she goes on to face in her personal life and the teamwork that goes into waitressing, teach her to be a team player. 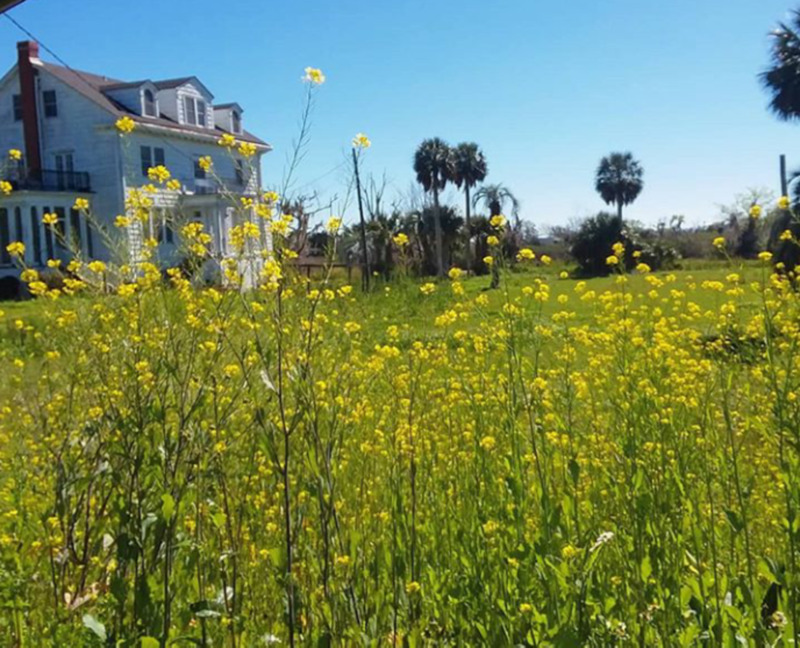 Bauer’s novel, Hope Was Here epitomizes the contemporary realistic fiction genre and has the power to potentially give readers who are facing the same problems as Hope, a reason to remain positive. The biography genre of children’s literature consists of books that narrate the lives of real people, whether historical figures or people who are still living today. Biographies are typically nonfiction and give readers the opportunity to learn more about the people who inspire them the most. For this genre I chose the book, Who Was Steve Jobs?, a factual biography written by Pam Pollack and Meg Belviso. 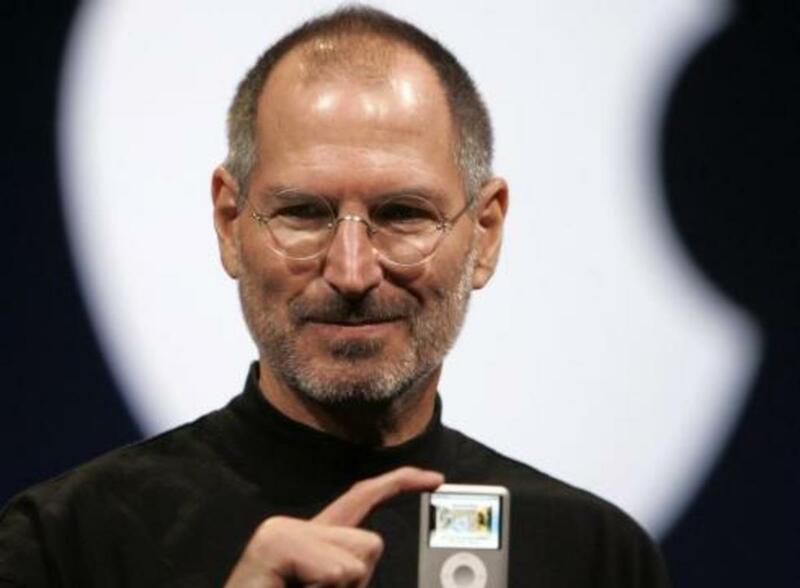 Who Was Steve Jobs? chronicles the life of Steve Jobs and the numerous events in his life that lead up to his success at Apple. The writers delve into the role he plays as a source of inspiration in the lives of tech savvy young people with his “Think Differently” marketing campaign. The biography begins in Napa Valley where Steve Jobs grew up as a child, raised by his adoptive parents Paul and Clara Jobs. The events of Steve Jobs’ life are told in order of their occurrence, beginning on February 24th, 1955 when he was born and ending on October 5th, 2011, the day of his tragic passing. At the end of the book the authors include a timeline of the major events described in the biography in the order of their occurrence. I chose this biography because Steve Jobs revolutionized the world of technology and young children of this generation are growing up in a highly technological world that has advanced, largely as a result of the innovations Steve Jobs set in motion. A potential problem with this biography is that it does not go into too much detail about particular technical design aspects of Jobs’ accomplishments. However, because this biography was intended for children, the authors simplified some of the more complex details of Jobs’ life. I feel the book, Who Was Steve Jobs? 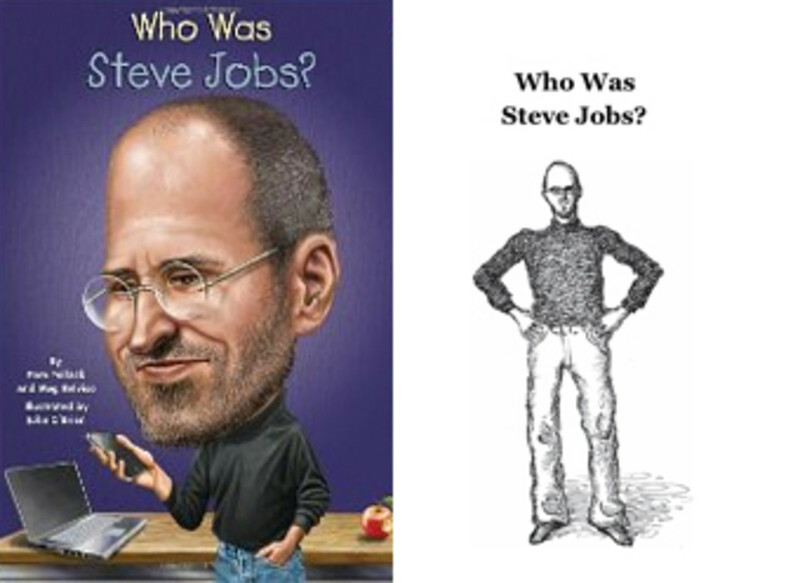 represents the biography genre because it describes Jobs’ achievements in simple words that are easier for children to understand, elaborates on his perseverance in overcoming obstacles and never giving up and includes all the noteworthy events to occur in his lifetime. The genre of historical fiction includes books that tell stories of history but unlike the biography and nonfiction genres, these books weave fictional stories into a factual historical context. The book I chose for this genre is The Watsons Go to Birmingham- 1963 by Christopher Paul Curtis. The story is set in 1963, during a time of upheaval in the civil rights movement when the question of whether or not segregation in America should end, was still being debated. This young adult novel particularly sparked my interest because it focuses just as much on factual historical events, as it does on fictional aspects of the story. The story opens with the narrator Kenny describing each of his family members, who he calls “the weird Watsons”; the setting begins in their hometown of Flint, Michigan. When Kenny’s brother Byron starts hanging out with the wrong crowd, the family decides to send him to live with his grandmother in Alabama. The American-American family makes the trip to Alabama and plans on staying there until the summer ends at which point they will decide whether Kenny should remain there permanently. But tragedy strikes when the grandmother’s church is bombed the family decides to pack up and go home to Michigan early. Unable to process the horrific events that happened during the church bombing, Kenny runs back into the church moments after the bomb was detonated, falsely believing that his sister is still in the building. After four girls just died in the building, the scene that Kenny witnesses leaves him stunned and Byron tries his best to explain to Kenny the act of racism that just occurred. 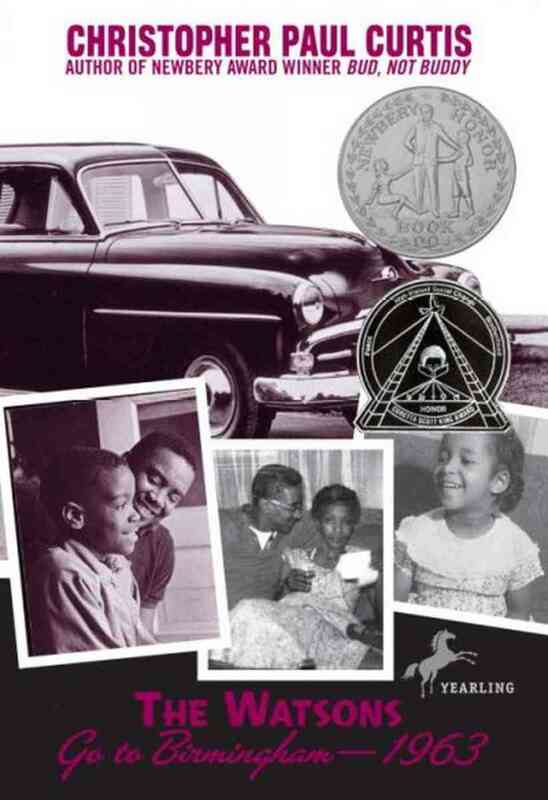 Though this book is more geared towards young adult readers rather than young children, I chose The Watsons Go to Birmingham to represent the historical fiction genre because it is accurate in its representation of a historical event that acted as a catalyst in the civil rights movement and the fictional family is relatable, helping readers better understand issues such as segregation in America. 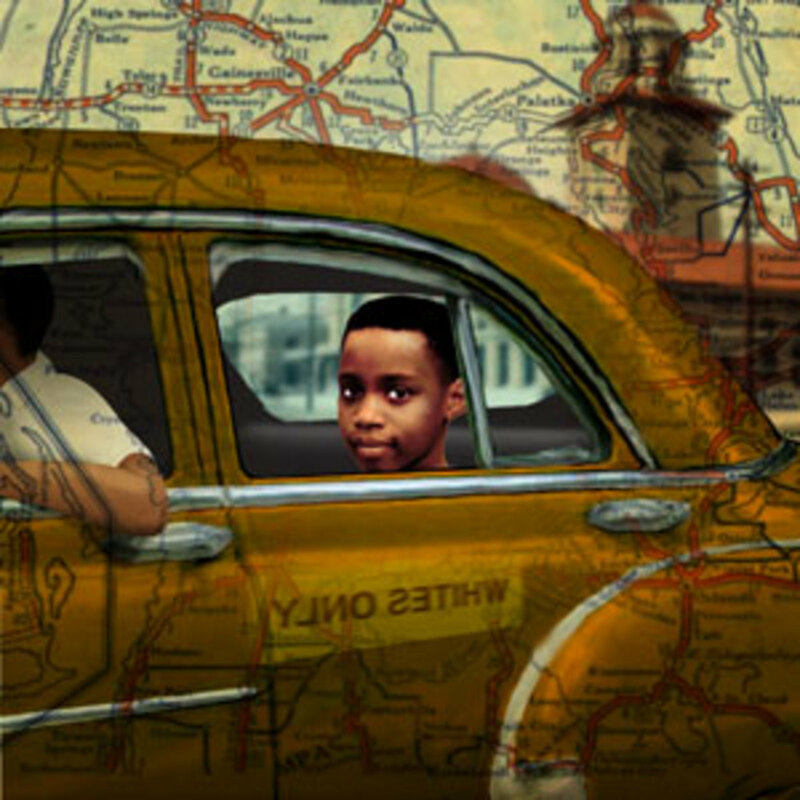 Although the Watsons are a fictional family invented by Curtis, these characters are multi-dimensional, they defy stereotypes and are portrayed as a very relatable American family, and after developing a bond with the narrator Kenny, the reader feels more in touch with the tragic events of the 16th Street Baptist Church bombing that actually occurred in Birmingham in 1963.